A strong attacking start from the OH team but strong defence by HCS (Georgie S & Laura S) kept them out. Finally though from a penalty corner - hit by Emily Rogers, saved well by Becky Kerridge, but out to Annie Orgee who put it back in to Hannah Larkin to score for the OH. HCS played their way into the game, the back line became more confident (good distribution from Lottie R) and starting to put together a few of their own attacks with strong runs from Lucy A and Sophie C. Second half, some good skills from Ciera W resulted in a couple of corners and near misses. Then another break from OH with through ball from Chloe Thomas allowed Emily Rogers to round the defence and cross for Polly Jordon to make it 2 midway through 2nd half. HCS fought for a goal and one finally came a few mins from time with a penalty flick scored by Lily Matheson. OH Football - Hereford Cathedral School - 0 Old Herefordians -4. Despite conditions being extremely difficult for a passing style of football , both teams delivered a performance that contained pieces of high quality . Although the HCS team consisted of mainly Year 11 boys they stood up to the physical challenge presented to them by displaying good determination and togetherness throughout . Marshalled by the Junior Schools very own Mr Turpin ( goalkeeper ) , the defensive unit stood strong under a barrage of both windy conditions and physical mismatches . The Old Herefordians showed their physical dominance early on by creating a handful of chances from crosses delivered into the 18 yard box , from which they opened the scoring. Their second came not long after when a ball sent in from a corner swirled viciously into a melee of bodies only for it to be deflected into the net from close range . Despite this the youthful HCS team continued to stick to their principals of play and produced some eye catching link up play especially through the midfield areas , and were unlucky to not to carve out a chance for themselves on a few occasions . The Old Herefordians continued to pose a threat through the rest of the first half especially exploiting the space in behind the HCS defence , and from on such opportunity won a penalty from a clumsy challenge by a HCS covering defender. The second half ended up being less eventful due to the HCS team getting to grips with with the oppositions attacking threat and also the OH lads running out of steam . Even so midfield areas were still competitive with aggressive and tenacious tackles all over the field . Chances were becoming less frequent with both Jasper Linley-Adams and Miles Newall hitting the crossbar in the latter stages of the game to deny the HCS team a thoroughly deserved goal. The Old Herefordians did manage to score a final goal late on when a defensive mix up left a simple tap in for the visitors . Despite the final scoreline the game was played in the right spirit and both sides showed immense respect for one another throughout . The young Hereford Cathedral side showed that there is a lot to be optimistic about in the spring term if they can work together in this way over the future months . Thanks to all the boys that returned to school to play the match and those that supported the game from the sidelines. 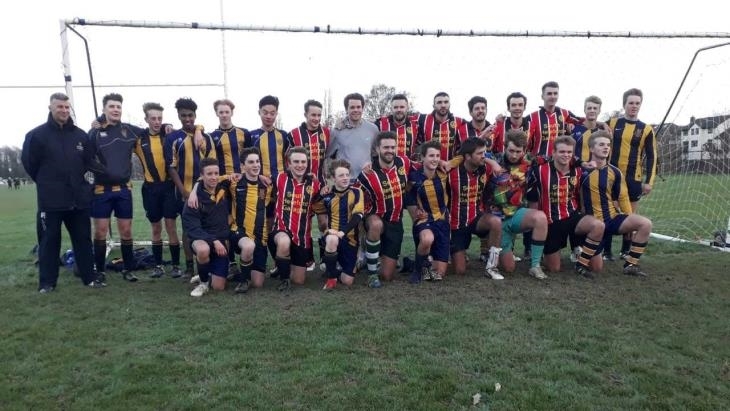 After a two year hiatus the Old Herefordian's Rugby match was resurrected in 2018, with a new format of leavers from the last two years joining the HCS Upper 6th boys to play the OHs from 2015 and older. The OH side was captained by Rob Erskine and featured many players from some of the more successful HCS 1st XV teams of recent times. Despite playing into the howling wind that was rushing down the Wye, the OH side took the lead through former 1st XV captain Oli Gaston (2015). The School came back strongly with tries from two more 1st XV captains, George Sweetman (current) and Joel Middleton OH (2016), achieving an impressive half-time lead of 12-5. In the second half, Sweetman added another try with an impressive solo run from his own half, handing off a number of despairing tacklers in the process. With tiredness setting in and having to contend with the wind, the school conceded another try, this time from Elis Ward OH (2015) which narrowed the deficit. Not to be outdone, Gaston added another try for himself, which was impressively converted, tying the scores. The game was played in fantastic spirit and both sides showed a monumental effort in both attack & defence in testing conditions; it was only fair that the honours were even at the end. Thanks to the boys who came back to play, and we look forward to doing it all again next year.